You are currently browsing the daily archive for May 7, 2010. Now this is the film I thought Un prophète would be. Despite all the hype surrounding that French prison drama—it was great—it never reached the pedestal of perfection for me. 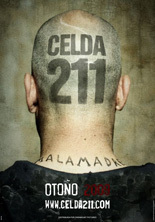 Yet here is the Goya sweeping Celda 211 [Cell 211]—not even given the country’s selection for inclusion on the Best Foreign Language Film Oscar list, but then that whole process of one per country is messed up to begin with—criminally given no buzz in America that I’ve been aware of. It snuck by me at the 2009 Toronto International Film Festival, but I refused to make the same mistake twice, checking it out at 2010’s 360|365 George Eastman House Film Festival. Daniel Monzón’s work is a masterpiece of prison dynamics between guards and inmates, as well as each faction amongst its own. Its gritty and uncompromising imagery is unmatched on the thrill scale, going to dark places fearlessly, causing the audience to even begin sympathizing with the criminal catalysts of a full-scale riot. At what point do the actions of over-zealous, unsympathetic guards become scrutinized and reformed on behalf of murderers and rapists? Do they even deserve to be treated as anything more than dogs? The film, adapted from a novel by Francisco Pérez Gandul, is co-written by Jorge Guerricaechevarría, screenwriter on my favorite Almodovar, Carne trémula, so asking questions like that shouldn’t be surprising. It all begins with the graphic suicide of Morao, creating a sharp blade from the melted and hardened innards of a cigarette before using it to slice his forearms, wrist to elbow. As jarring as the scene is, putting you right into the hellish nightmare you’ll be residing in for the duration, the death isn’t put into context until later. Finding out the reasons for his demise, the criminal negligence precipitating the action, becomes a driving force towards why Malamadre, sentenced for life and already a veteran of leading a huge prison uprising, stages his riot. A trio of terrorists has arrived—a fact fed to him by an unknown loudmouth—and is the perfect fit for a hostage situation. It doesn’t take long for him to gain control of an entire wing, lackeys and friendly ethnic leaders by his side, ready to set his demands and do whatever is necessary since he has nothing to lose. But there is an unknown factor no one could have imagined. The event occurs on the day before Juan Oliver is to begin working at the prison. Hoping to make a good impression, he arrives early for an impromptu tour of the facility, brown-nosing with a kind-hearted guard Armando and his ill-tempered superior Utrilla. A concrete block falls from the ceiling, causing a third guard to step away from Malamadre just long enough for the criminal to spit up a blade and put everything into motion. It ends up that Juan was hit in the head, blacking out and becoming a liable to the safety of his two comrades who decide to leave him in cell 211, unoccupied for reasons that will be revealed later on, in order to save themselves. One of Malamadre’s cohorts discovers the bloodied man unconscious on the floor and goes to get his boss to clear up the aberration, but Juan is smart and regains his wits quickly. He removes everything his coworkers just finished telling him were contraband for inmates, disposing of his belt, shoelaces, jewelry, and wallet inside the toilet, awaiting his inevitable captors to bring him out, praying he can trick them into thinking he’s a killer too, at least long enough to get out. And so the film begins with Juan’s transformation into Calzones, an intelligent killer with a wife and baby on the way—truth within the lie—that on more than one occasion saves Malamadre from making critical mistakes. The lies bill Calzones as a head case and his fearlessness to look Malamadre in the eye, telling him what’s on his mind, forms a deep bond between the two men, something this self-proclaimed general’s compatriots Tachuela and Apache see as an error of judgment, setting on a mission to find out who Juan Oliver really is. But the relationship has been cemented, even if Juan still has his sights on finding a way for the hostage negotiators to let him leave, thus freeing him from the chaos of unpredictable, hasty action. Unfortunately the spiral continues to spin out of control as every second passes, subverting his chances and rendering it all moot once the SWAT team waiting outside threatens to enter and recover the terrorists. The unpredictable series of events occurring also begin to effect Juan personally, opening his eyes to the injustice and brutality inflicted on the guilty, transforming him from optimistic father-to-be into a man with nothing to live for other than revenge and pride. The psychology necessary to keep the plot organic stems from the two amazing performances by Luis Tosar, (Malamadre), and Alberto Ammann, (making his feature film debut as Juan). Tosar is a formidable loose cannon that you do not want to anger or get in his way. Willing to take all the heat this riot will bring, he does it for his fellow brothers behind bars, sick of the way they are treated. When he sits down with Calzones and talks from his heart, you see the compassion that resides within his broken, amoral soul; the code of survival his family of criminals lives by on the brink of obsolescence. And then there is Ammann, equal parts scared kid caught behind enemy lines and cool, collected actor doing what’s needed to survive. He has the utmost confidence that the negotiators will get him out before anything crazy happens, so he strings Malamadre along, learning everything he can, but at the same time slowly awakening to what it is these men contend with on the other side. Unfortunately, it soon becomes apparent that the men trapped are smarter than those holding the guns. The rescue mission gets out of control as guards begin to take matters into their own hands, looking to be heroes and also cover up mistakes made to help make the riot possible. Monzón’s attention to detail and ability to hide clues until just the right moment ratchets up the suspense so you are on the edge of your seat throughout, not wondering if this powder keg is going to blow, but when. There is backstabbing, violence as a means to make a point, united compassion for a second riot—this time family members of the incarcerated wondering who was killed early on—happening outside, and a willingness to make good on their threats of murdering the most dangerous killers held captive, ironically the only lives the police need to remain safe. The politics of the situation are only on the surface of greater issues concerning empathy and the quest for justice. No matter what your opinions on the subject—I myself lean towards the Fascist spectrum of killing every criminal from murder to jaywalking in order to quell all unlawful activity—the performances and evolution of story will make you question your beliefs. Only when you become trapped on the other side, experiencing the blind injustice usually swept under the rug, do you fully understand the meaning of humanity. You can’t pick and choose what suits you at any given time; just ask Antonio Resines’ Utrilla and Marta Etura’s Elena Oliver. The two become involved in a climactic moment, changing everything and making Celda 211 go from great film to mind-blowingly intense masterpiece. It is brutal, unfiltered, thought provoking, and above all else real. You can’t ask for any more than that. 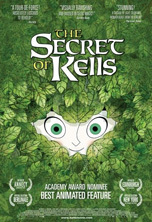 I remember the morning that Oscar nominations came out and hearing which films were up for the Best Animated Feature, completely perplexed when The Secret of Kells was announced. I had been nodding my head in a gesture of agreement until that moment, having never heard the film’s title before in my life. Well, thanks to the 360|365 George Eastman House Film Festival, I was able to finally enter Tomm Moore’s Celtic world at the time of the legendary Book of Kells’ creation. Probably the most famous illuminated text in existence, Moore, along with screenwriter Fabrice Ziolkowski, have crafted a mythology around its birth—the secret of their title being how a young orphan boy named Brendan and his wood nymph friend Aisling were instrumental in its survival at a time of utter slaughter by the hands of Vikings/Pagans, destroying everything in their wake. It’s a tale of the arts versus military security, on whether it is more important to spend resources on a wall that may only delay the inevitable invasion at hand or on a manuscript that will unite a people and preserve a heritage worthy of death in order to protect it. The story itself is nothing spectacular as it pretty much uses the age-old story of a boy becoming a man as he learns from a sage old voice what life is truly about, rebelling against the parental figure that has been caring for him his whole life. Add in a fantastical creature like Aisling, an otherworldly entity that can talk to nature and soothe its more dangerous inhabitants and voila. Disney has done this type of fictional narrative for decades now, but never have they allowed their hand drawn, two-dimensional animation look so spectacular in a hyper-stylized splendor. The visuals are what sets Kells apart from anything else released in 2009, leaving its mark on the world as a piece of art unafraid to use the technique and aesthetic it talks about as the storytelling. Everything put onscreen carries the essence of the drawings in the sacred Book of Kells, (don’t miss a great animated look at the Chi Ro page from the book brought to life right before the end credits); utilizing the same style its Irish monk creators did around 800 AD. This film becomes more a testament to the precise detail and impressive artistry of the book than an attempt to tell a great children’s story. The fact it does both only adds to its pedigree and enjoyment. It is a completely Irish endeavor, so don’t be surprised if you can’t recognize any of the voices, besides Brendan Gleeson as Abbot Cellach, uncle to young Brendan (Evan McGuire). But don’t let that discourage you; each voice actor does a wonderful job portraying this community of monks looking to fortify Kells from the same insurgents that recently destroyed the city of Iona. The greatest illuminator the world had known fled that city just in time, bringing with him the unfinished manuscript, then known as the Book of Iona. His arrival occurs right after the quartet of bumbling, comic relief monks finished telling Brendan about Brother Aidan, so of course they are in awe to find the legend in the flesh and at arm’s length. Voiced by Mick Lally, although I could have sworn the voice was Brian Cox’s, he is the sole voice of reason in the now totalitarian state formed by the Abbot, who forces he and his cat Panger to stay in the scriptorium while wall fortifications made sure the ‘precious book’ would be safe. We never do find out what in the Abbot’s past caused him to turn so jaded and untrusting, but this ex-illuminator could do nothing but rule with an iron fist now, even locking his nephew away in a cellar so he wouldn’t enter the forbidden forest again. No lock could keep him away, however—not with Aisling, (a great childlike performance with the perfect amount of stubbornness and authority despite Christen Mooney’s girlish voice), on his side. The one instance of song in the film, she transforms Panger into a malleable visage she can charm like a snake to free her brave friend, allowing him to go back into the woods and find the eye of the ‘Dark One’, a crystal with the magnifying power necessary to complete the drawings in the book. Aidan’s own was lost in his escape from Iona—a beautifully animated sequence at the start of the film with ocean wave imagery reminiscent of Katsushika Hokusai’s famous The Great Wave off Kanagawa, tumultuous and frenetically paced, showing the full capacity of the unique visual aesthetic used throughout. Between the Dark One’s lair and the menacing, blacked out, bull-horned Vikings, I would take pause when thinking about bringing a young child to the film. The imagery can be a bit frightening, but when the story’s ultimate goal is to show how a book that could turn those horrors into the light of optimism and hope was created, you do need evil to live up to its name. 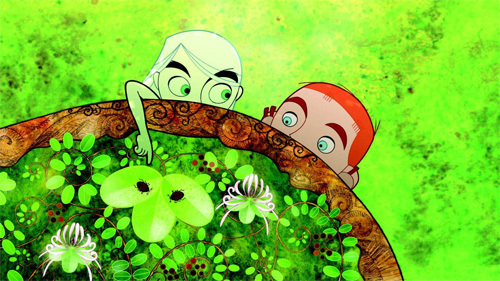 The Secret of Kells is only around 77 minutes, but it does pack a lot into that timeframe. Brendan’s evolution and help from his monk friends in order to subvert the authority of the Abbot are crucial to his becoming the man he grows up to be, the driving force in the Book of Kells’ completion. Aidan is only in Kells for a briefly before the Vikings arrive, so there isn’t much time to win the boy over and discover his true artistic potential, nor for the Abbot to face his own darkness and have a chance to conquer it before it’s too late. The fact that we are able to have such stunning imagery tell the story serves as a metaphor for the book itself, showing how effective our senses can be at enhancing what is otherwise straightforward. The Book of Kells isn’t necessarily known for its tales of the New Testament as much as for its artistic flourishes and incomparable beauty. Moore’s film is similar in that while I found Brendan’s fantastical journey endearing and memorable, it was nowhere near as powerful as the indelible mark left by the stunning swarm of butterflies, the brutal reds and yellows of Pagan destruction, or the textured marbleization superimposed as patches of light on the flat cells of animation. It’s the perfect Celtic look and feel to create awareness for one of the most famous Irish works of art; you haven’t seen anything quite like it before. 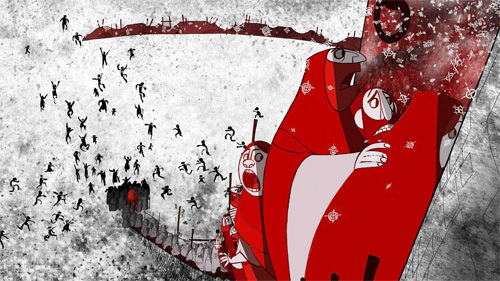 [1 & 2] A scene of animation adventure from GKIDS’ The Secret of Kells. The second half of a Mark Lewis documentary short doubleheader at the 360|365 George Eastman House Film Festival was his 2008 look inside of the Cinema Museum. A private collection owned by Ronald Grant and Martin Humphries in Britain, their curator Anna takes us on a first person tour of the cluttered and packed rooms full of movie memorabilia spanning decades. Lewis shoots it all, I would guess, with a Steadicam that he helms, following Anna through the corridors and into cramped rooms, or often just roaming to catch glimpses of interesting objects while we still hear his guide talking and rummaging through drawers. He must have told her not to feel bad if she was ignored because she will often sift through files for a good example of a lobby card or poster, holding them up while Lewis is either too far away for a detailed look or not even in the same room anymore. While the 35-minute film is billed as a continuous shot, it actually isn’t. There are multiple fades to black, picking up right away as though footage needed to be excised. Had it been one long take, I think the artistry of the film might have overshadowed the ephemera on display. As it is, the objects we view become the main focal point, and that is the purpose of this insider’s look at a private collection spanning unique materials like posters, scripts, films, film cans, trade magazines, international print work, mini models of theatre houses, and so much more. We’ll catch a glimpse of a gorgeous hand-crank projector or vintage show times calendar and in the next turn of the camera see a giant cardboard stand depicting Jeff Goldblum or spy a small cutout of Martin and Moranis from the My Blue Heaven poster hanging above our heads. All eras are represented, making this a collection of the good and the bad—the totality of cinema history. 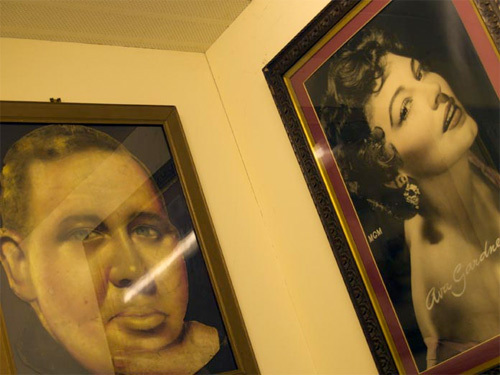 Even things Anna personally dislikes, a wall of Florence Desmond paintings for instance, can be appreciated for the insight they bring towards their subject matter. Lewis does a fantastic job to make sure that his vantage point will become the audience’s. There are so many reflective surfaces from glass cases, mirrors, or framed posters, but he never allows his image to show. The camera is constantly angled from being seen, making certain that what’s onscreen is viewed through our eyes and not a secondary filter. Anna will sometimes say Mark’s name, but mostly she’ll simply mention, “I see you’re interested in the posters,” or whatever else he decides to focus an extra beat of attention to. I did at times feel bad that she was giving all this great information and we rarely see what it is she is talking about, but then I recall my own ADHD mentality while on a museum tour. I always end up keeping my ears open to the tour guide while my eyes wander to soak in as much visceral data as possible. So, the experience is very similar to if I was in this collection myself, wandering around to see antique theatre seat ash trays, mazes of old film stock, (no nitrates due to flammability), and a small screening room with barely room to sit down, perfect for the worldwide, once a year, ‘Home Movie Day’. 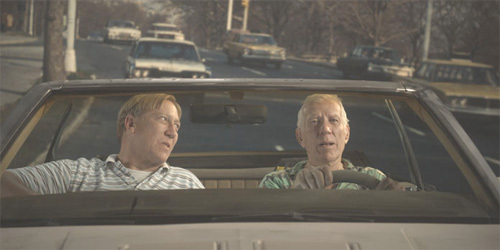 What better way is there to tell the story of the cinematic technique called rear projection than with the father/son duo integrally involved in its success, interviewed in front of their own technology? It definitely helps that Bill Hansard Sr. and Bill Hansard Jr. possess such a humorous attitude and candid nature, keeping Mark Lewis’ documentary short Backstory as fun as it is informative. For every story about new riggings for improved car motion footage or technological innovations to even get a self-proclaimed hater of the process like Sean Connery to willingly participate in an extra day of shooting, there is an anecdotal tale of Mickey Rooney’s claustrophobia, Sly Stallone’s stubbornness, or even Bill Jr. calling his Pops out for the affair he began while on location in France. The elder Bill relays how he got into the business, beginning at the bottom with the company his father started and eventually making it into the number one go-to business for rear projection effects. He honed his skills and knew his stuff, using new inventions like the selsyn motor to sync projector and camera shutters together, (once static plate projection became obsolete), and constantly getting into fights with grips and other crew on set that had the gall to question his expertise or do stupid things like fold a screen rather than roll it up. So precise in his materials and quality assurance, when a crew set his equipment up without him present, he’d make them take it all down, pack it up, and do it again. His son says that this attitude might not have gotten them many friends, but it did keep their presence a necessity. Bill Jr. used that to his advantage and worked on countless movies, always known on sight as the rear projection guy if not by first name. However, through the stories that only someone involved could know—like the drowning of ducks in attempts to keep them static in a shot on an unnamed film—comes the reality of the present. With green screen and other computer techniques, the process that the Hansard name made integral to cinema has all but died. Bill Jr. has begun taken jobs screening footage for Hollywood types and Bill Sr. is biding his time until all that’s left for him to do is donate some equipment to museums and sell the rest as scrap metal. They still say that films are only as good as the footage shown behind the actors, but the cost of their process just isn’t viable anymore. It’s another aspect of cinematic history that has been left by the wayside. At least Lewis allowed them one last opportunity to do what they’ve always done best, making sure this documentary was completely shot in front of screen projections. And the guys get to have some fun, eating corndogs at the hot dog stand, driving the roofless car rig, and standing on the beach, giving themselves the opportunity to set the record straight on their livelihood and give it one final swan song.